Subscribe to the Blog to receive email notification of breaking SSEP News. Use the Subscribe Box at the bottom of the right column. If the image is black, you may be using a less than optimal browser such as Safari (try Chrome), or ISS is on the night side of Earth. To check, use the ‘ISS Current Location’ above. Note: ISS orbits Earth in 90 minutes, with 45 minutes of daylight followed by 45 minutes of darkness. A careful read of this home page will provide an Executive Summary of the Program. The rest of this website provides a deeper understanding of program pedagogy and operations; guidance for how a community can come aboard; and resources to conduct the program. 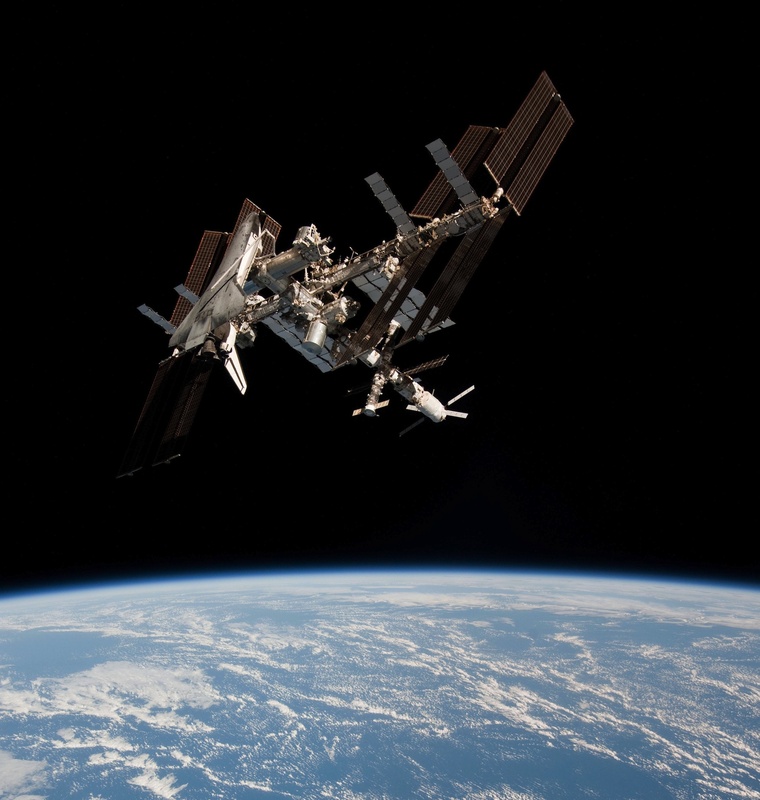 The Student Spaceflight Experiments Program (SSEP) was launched in June 2010 by the National Center for Earth and Space Science Education (NCESSE) in strategic partnership with NanoRacks, LLC. Designed as a model U.S. national Science, Technology, Engineering, and Mathematics (STEM) education initiative, the program gives typically 300+ students across a participating community the ability to design and propose real microgravity experiments to fly in low Earth orbit (experiments conducted in a “weightless” environment), first aboard the final flights of the Space Shuttle in 2011, and then on the International Space Station (ISS) – America’s newest National Laboratory. SSEP is suitable for students in pre-college grades 5-12, 2-year community colleges, and 4-year colleges and universities. In 2012, SSEP was extended to international communities through the Arthur C. Clarke Institute for Space Education, NCESSE’s new international arm. More broadly, SSEP is about a commitment to student ownership in exploration, to science as journey, and to the joys of learning. Of special note – SSEP is garnering significant media coverage at local, regional, and national levels (over 1,100 articles to date). School districts are powerfully leveraging media exposure for their participation in this high caliber STEM initiative, and at a time when STEM education is of national strategic importance, and is becoming a core element of the curriculum at the local level (see the SSEP in the News pages, and e.g., a recent Scientific American feature article). Important note: SSEP is not designed for an individual class or a small number of students in a community. Implementing SSEP for an appropriate-sized student audience is straightforward, and implementation plans for a large number of participating communities are available for review. Each community participating in SSEP is provided a very real research asset – a flight certified, straightforward to use microgravity research mini-laboratory, and guaranteed launch services to transport the mini-laboratory to the International Space Station (ISS). It is a precious and limited research asset given that the mini-laboratory can only contain a single student team designed microgravity experiment. An astronaut aboard ISS will conduct the experiment, and after a typical 4 to 6 week stay in orbit, the experiment will be returned safely to Earth for harvesting and analysis by the community’s student flight team. Mirroring how professional researchers formally compete to obtain limited research assets, the participating community carries out a “call for proposals”. More specifically, the community conducts a local Flight Experiment Design Competition, engaging hundreds of students in teams of typically 3-5, with each team vying for the community’s single experiment slot by proposing a microgravity research program that can be carried out in the mini-laboratory. The competition is conducted through formal submission of real (but grade level appropriate) research proposals by the student teams – as is standard practice for professional researchers. A minimum of 50-80 flight experiment proposals are typically secured across a single community. Each community’s flight experiment is selected through a formal 2-step proposal review process. The final selection is carried out by the SSEP National Step 2 Review Board, which meets at the Smithsonian National Air and Space Museum in Washington, DC. The flight experiment then undergoes a 4-month NASA flight safety review at Johnson Space Center, laboratory refinement by the student flight team, handover to NanoRacks in Houston for integration into the experiment payload, and payload integration into the ferry vehicle for flight to ISS. SSEP experiment payloads launch from either Cape Canaveral Air Force Station, Florida, on a SpaceX Dragon spacecraft, or from the Mid-Atlantic Regional Spaceport (MARS), Wallops Island, Virginia, on an Orbital ATK Cygnus spacecraft. SSEP is not a simulation – this is very real spaceflight. This is very real student immersion in space science research, and a remarkable opportunity for a community. SSEP provides each community its own – very real – Space Program. An annual SSEP National Conference held at the Smithsonian National Air and Space Museum in Washington, DC, immerses delegations of students in a real research conference where they formally present to their peers on experiment design and science results (explore the 2018 Conference page, and video clips of presentations archived on the Scientific Return and Reporting pages, see e.g., Mission 11 to ISS Scientific Return and Reporting and Mission 12 to ISS Scientific Return and Reporting). A suite of SSEP program elements—the Community Program—leverages the flight experiment design competition to engage the entire community, embracing a Learning Community Model for STEM education. One element is a Mission Patch art and design competition allowing hundreds of students across the community (down to grade K) to capture through art and design their community’s SSEP experience. Up to two Mission Patches accompany the community’s selected flight experiment to low Earth orbit. Mathematics to design a viable experiment to operate in the mini-laboratory, through: refinement of sample (fluid and solid) concentrations and volumes, defining a timeline that is consistent with the experiment’s duration aboard ISS, and defining an approach to data analysis after the experiment returns to Earth. In addition, student teams are writing real proposals that then go through a formal review process. This addresses vital skills in terms of historical research, critical writing and communications, and teamwork. Through this authentic trans-disciplinary approach to STEM education, SSEP is designed to inspire and engage the next generation of scientists and engineers, and more generally, address STEM literacy. For school districts—even individual schools—SSEP provides an opportunity to implement a systemic, high caliber STEM education program tailored to community need. With the Mission Patch art and design competitions, SSEP is more appropriately designated a STEAM initiative. Communities Internationally: in European Space Agency (ESA) member nations, European Union (EU) member nations, Canada, and Japan with participation through NCESSE’s Arthur C. Clarke Institute for Space Education. Communities in other nations should explore the potential for their participation by contacting the Institute. Since program inception in June 2010, there have been fifteen SSEP flight opportunities—SSEP on STS-134 and STS-135, which were the final flights of Space Shuttles Endeavour and Atlantis; and SSEP Missions 1 through 13 to ISS. A total of 178 communities have participated in the program, reflecting 41 States and the District of Columbia in the U. S., 4 Provinces in Canada, and a community in Brazil. Thus far 52 communities have participated in multiple flight opportunities – one community is even conducting their 9th flight with Mission 13 – reflecting the sustainable nature of the program. Through the first fifteen flight opportunities (through Mission 13), a total of 109,950 grade 5-16 students across 2,192 schools were fully immersed in microgravity experiment design and proposal writing, 22,442 flight experiment proposals were received from student teams, and 281 experiments were selected for flight. Through Mission 13, 147,400 students across the entire grade preK-16 pipeline were engaged in their communities’ broader STEAM experience, submitting 120,670 Mission Patch designs. Explore the Flight Opportunities to Date page, which provides launch and landing dates, and information on the ferry spacecraft, astronaut crews aboard ISS during experiment operation, and the SSEP flight experiment payloads. Explore the separate SSEP website – the SSEP Community Network Hubsite – which is dedicated to the participating communities and the over 1,150 organizational partners at the local level. At the Hubsite, you can read profiles of the participating communities, see a map of the Community Network, read about the selected flight experiments and flight Mission Patches, explore the many hundreds of media articles on SSEP, and watch videos of student teams reporting out at the SSEP National Conferences in Washington, DC. The National Center for Earth and Space Science Education, and the Arthur C. Clarke Institute for Space Education announce the sixteenth SSEP flight opportunity – SSEP Mission 14 to ISS – which provides for an experiment design competition Fall 2019, and a ferry flight of the selected flight experiments to ISS in Spring 2020. SSEP Mission 14 to ISS is currently the only SSEP flight opportunity available. ASAP: Interested communities are directed to contact NCESSE as soon as possible, but no later than May 17, 2019, to explore participation. It typically takes 3-4 months in advance of program start to plan and fund the program in a community (funding with assistance from NCESSE if required – see below). A community can open the competition to any grade level(s) in the grade 5-16 range, and through the provided elements of the SSEP Community Program, engage wider audiences (all grade levels, families, and the general public). The Community Program includes: a competition to design a Mission Patch to fly in space with your flight experiment, and a SSEP National Conference in Washington, DC. The Community Program also provides the means for a National Team of scientists and engineers to travel to your community for up to a week, and engage thousands of grade K-16 students—one classroom at a time; conduct family and public programs like those the Center conducts at the National Air and Space Museum; and provide professional development for grade K-12 teachers. SSEP is a bold new commercial space venture in partnership with DreamUp PBC and NanoRacks LLC. The National Center for Earth and Space Science Education, a 501(c)(3) non-profit, must recover the actual costs for the program (lease of commercial space for the mini-laboratory in the flight payload and aboard ISS, all flight services to and from low Earth orbit, program delivery and community support), but also recognizes the significant challenge to a community in securing underwriting in the current financial climate. That said, the Center is committed to trying to find funding for any community in the U.S. and Canada interested in participating. The Center found full or partial funding for 204 of the 271 SSEP community programs undertaken as part of the first 15 SSEP flight opportunities, and we now have active relationships with a national network of a few hundred funders. If you are interested in this program, let us help. The Student Spaceflight Experiments Program (SSEP) is a program of the National Center for Earth and Space Science Education (NCESSE) in the U.S., and the Arthur C. Clarke Institute for Space Education internationally. SSEP is enabled through a strategic partnership with DreamUp PBC and NanoRacks LLC, which are working in partnership with NASA under a Space Act Agreement as part of the utilization of the International Space Station as a National Laboratory. NCESSE, the Clarke Institute, DreamUp, and NanoRacks are therefore designated SSEP Strategic Partners. Visit the Strategic Partners page to read about their SSEP programmatic roles and responsibilities. SSEP is the first pre-college STEM education program that is both a U.S. national initiative and implemented as an on-orbit commercial space venture. NCESSE and the Clarke Institute are proud to be working with the following National Partners on SSEP — in the U.S., the Smithsonian National Air and Space Museum, the Center for the Advancement of Science in Space (CASIS), and Subaru of America, Inc., and in Canada, Magellan Aerospace. To read more about these partnerships, visit the National Partners and Sponsors page. Underwriting by Conference and Event Sponsors make events for the SSEP community network possible. Read more at the National Partners and Sponsors page. Partnership is truly a hallmark of SSEP. Over 1,150 organizations have supported SSEP at the local level, including: school districts, private schools, NASA Space Grant lead institutions and other universities, corporate foundations, businesses, community foundations, and local research institutions. These organizations are designated the SSEP Local Partners. To explore the Local Partners, visit the Communities & Local Partners page at the Community Network Hubsite. SSEP was designed to be a keystone initiative for U.S. National STEM education, and to help inspire America’s next generation of scientists and engineers. Through the Arthur C. Clarke Institute for Space Education, the International arm of the National Center for Earth and Space Science Education, SSEP participation is also being expanded internationally to reflect the multinational complexion of ISS operations. We want SSEP to provide routine student researcher access to space via commercial payloads, to leverage the power of such access into a STEM education program delivered at the local level across an entire community, and to serve a network of such communities across the nation—even internationally. Phase 1 of the program was a unique and historic opportunity for students to propose experiments to fly aboard STS-134 and STS-135, the final flights of the Space Shuttle. We wanted the final voyages of the Space Shuttle to also mark a new beginning for private sector sponsored student experiments in space. Phase 2 of the Student Spaceflight Experiments Program, launched June 2011, provides sustainable, ongoing access to space for communities of grade 5-16 students inspired to propose experiments for low Earth orbit aboard the International Space Station, with transport aboard the NanoRacks manifest of cargo ships after the Space Shuttle era comes to a close. together let’s help your students step into the shoes of scientists and engineers … right now. INTERESTED? YOUR NEXT STEP: go to the About SSEP page for a comprehensive overview of SSEP, including a description of strategic STEM objectives, program elements, customization to community need, and cost. All content on this website is Copyright 2019, National Center for Earth and Space Science Education (NCESSE). Any use of this content without the permission of NCESSE is prohibited.